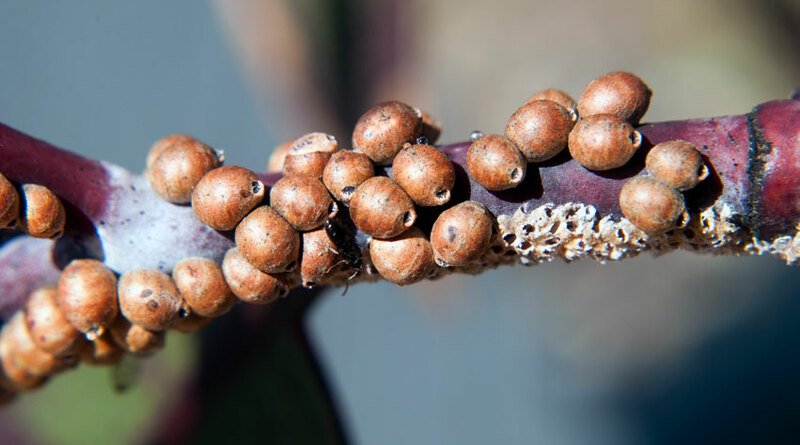 Scale insects are small, brown, limpet-like, sap-sucking insects that attack a wide range of plants – mainly woody plants, and especially those with waxy leaves. Most are smaller than 6mm (¼in) in size, although wisteria scale for instance can be twice this size. The actual insect is covered by the hard, scaly, shell-like covering, which helps protect it from predators – and most types of insecticides. Some species produce highly visible white, waxy egg masses in summer – hydrangea scale being a good example – which also contains the young nymph stage of the lifecycle. This is often the first thing you notice, having been unaware that your plants have scale insects, since they are very well camouflaged. Adult scale insects are sedentary – never moving – but the newly hatched young nymphs, or “crawlers”, crawl over the stems and leaves to find somewhere to spend the rest of their lives. 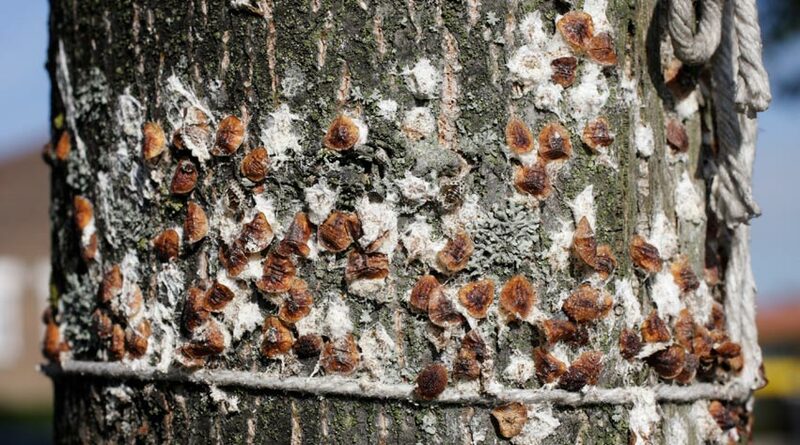 There are around 25 different species of scale insects. Some attack a wide range of plants, whereas others only attack one or two plant species, and some may only attack plants inside the house or greenhouse. Being sap suckers, scale insects extract sap from the plant, which can weaken the plant – especially small and young ones. As they feed, scale insects excrete a sugary, sticky substance, known as honeydew, which drops on to the leaves below where they’re feeding. This not only makes the leaves sticky, but the sugar attracts sooty mould, which can cover the whole leaf with a black deposit that reduces or prevents light reaching the leaf and so reduces the plant’s overall vigour. Ants feed on honeydew, so lots of ant activity may be a sign of scale insect attack. Check your plants regularly, looking at stems and the undersides of leaves – especially along the midrib of the leaf – looking for the limpet-like scale insects. Deal with any you see – as soon as you see them. If possible, start by carefully scraping off as many of the scale insects and their egg masses as possible. A plastic plant label is particularly useful for this. Scrape the label into some kitchen towel and destroy them. Then wipe the affected areas with more paper towel to remove further eggs, nymphs and adults. There are numerous chemical insecticides available that will kill soft-bodied insect pests. Just bear in mind that the majority of these are what is known as “contact” insecticides. That is, you have to spray the actual insect (make contact with it) to kill it. As the scaly covering protects the scale stage of the insect, they are unlikely to have much if any effect. But, they are effective against the nymph stage, so spray these in early and mid-summer. A systemic insecticide (BugClear Ultra) – which also kills on contact – is absorbed by the leaves and moves all around inside the plant, so will control the scale stage for up to two months. There is nothing you can do to protect your plants from attack. Just be vigilant for attacks and deal with them promptly.